Moratorium NOW! marchers outside Coleman A. Young Municipal Center May 9, 2012. DETROIT – The day before a state review team leaked information about a negative report on Detroit’s finances, the Moratorium NOW! 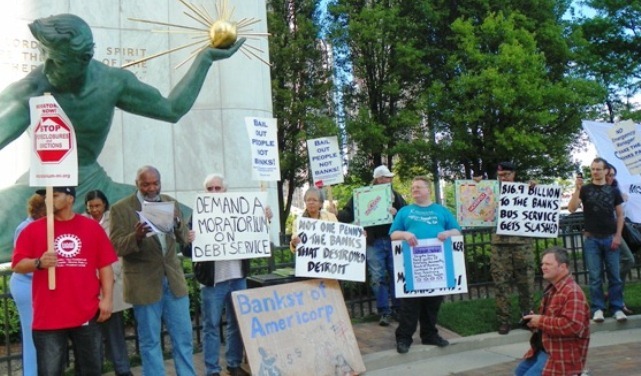 Coalition filed suit on Feb. 14 in Wayne County Circuit Court demanding “release and copies of the City of Detroit’s bond issues and interest rate swaps with the banks.” The city’s debt totals $16.9 billion through 2032. It paid $597 million on that debt in the last fiscal year. David Sole (r) holds sign while Rev. 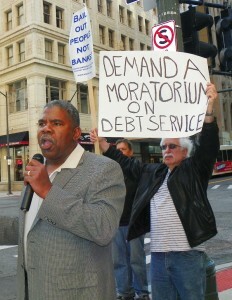 Charles Williams Sr. addresses rally against banks May 9, 2012. “The lawsuit is to launch an independent review of the City’s massive debt service payments to the same banks which caused the financial crisis in the city with their racist predatory lending practices that resulted in 150,000 foreclosures from 2005-2010,” said Dave Sole, the named plaintiff in the suit, in a release. The Detroit Free Press reported Feb. 17 that the Financial Review Team completed its report Feb. 15. 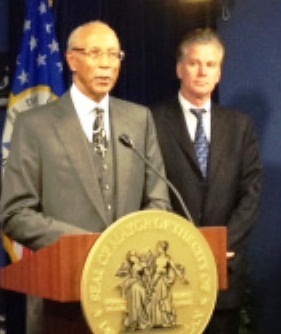 Detroit Mayor Dave Bing (l) and Michigan Treasurer Andy Dillon, who heads Financial Review Team. “The report, which the state-appointed review team completed after meetings in Detroit on Friday, outlines monstrous debts and a chronic inability to reverse course, highlighted by infighting and disagreements between Bing and the council,” said the Free Press. Sole said the Moratorium NOW! Coalition is demanding a people’s audit of those same books and debts. 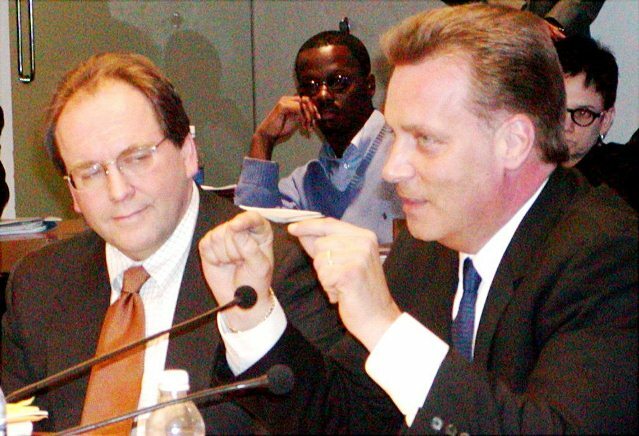 Joe O’Keefe of Fitch Ratings and Stephen Murphy of Standard and Poor’s at Detroit City Council table Jan. 31, 2004, foisting $1.5 billion loan on city. Sole said the group will be recruiting experts to analyze the documents once they are received. He first filed a Freedom of Information Act request for the documents in January, but despite a promise from the city that it would respond promptly, it has failed to do so. Snyder reacts angrily after voters repeal PA 4 last November, 2012. With regard to the review team, Michigan Gov. 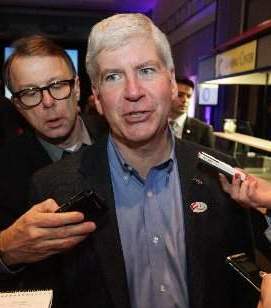 Rick Snyder appointed it Dec. 18, under provisions of Public Act 72, the predecessor to Public Act 4, repealed by voters in November. He did so despite the Detroit City Council’s majority cave-in Dec. 11 to all demands by his and Dillon’s offices. The Michigan Supreme Court on Jan. 13 refused to hear an appeal of a suit filed by Robert Davis against Detroit Public Schools Emergency Financial Manager Roy Roberts, which said that PA 72 is dead according to state law. The legislature and Governor enacted another emergency manager law during its December lame duck session. It includes appropriations to pay EM’s, a provision which allegedly makes it exempt from voter repeal. It will take effect March 27, 2013. 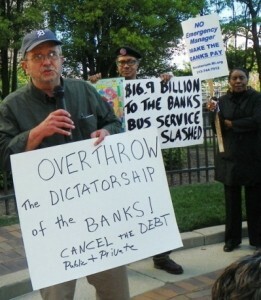 Demo against banks May 9, 2012. 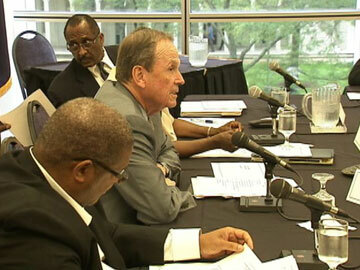 Ken Whipple (center) and Darrell Burks (rear) of Financial Advisory Board also sit on Financial Review Team. They are shown here announcing more furlough days for city workers. VOD has nonetheless filed an FOIA for a copy of the report with the Governor and State Treasurer Andy Dillon, who heads the review team. Its other members are state Auditor General Thomas McTavish, Ken Whipple, board chairman of Korn/Ferry International; Darrell Burks, a senior partner with PricewaterhouseCoopers; Ronald Goldsberry of Deloitte Consulting; and Frederick Headen, a legal adviser for the state Treasury Department. Whipple and Burks are also members of the Financial Advisory Board appointed under a Public Act 4 consent agreement with the city of Detroit. The FAB just imposed additional furlough days on unionized city workers, despite the fact that negotiations are ongoing with the city’s unions and that the continued existence of the FAB and the consent agreement are legally questionable.